While most people know that the Eiffel Tower is in France, and some people even know that it is in Paris, many people still wonder, "Where is the Eiffel Tower located specifically in Paris?" Where Is the Eiffel Tower Located in Paris? Paris is divided into sections, called arrondissements, which spiral outwards starting from the first arrondissement in the center of the city. 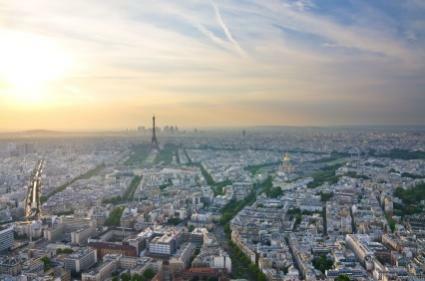 The Eiffel Tower is located in the seventh arrondissement, near the Seine, on the left bank (Rive Gauche) of the river. The tower is found at one end of the Champ de Mars (the green area where lovers are frequently photographed with the tower in the distance), and is bordered on the opposite side by the Quai Branly. Across the Seine is the Avenue de New York and the Palais de Chailly. The tower can be reached by several main boulevards through the city, or by taking the subway or hailing a taxi. Another fun route for tourists is to take one of the Parisian riverboats traveling the Seine, which stop in front of the Eiffel Tower. A walk along the Seine (or several of them) is a must for any visit to Paris. Starting from Île de la Cité, head west along the Seine in order to reach the Eiffel Tower. While the tower itself is on the left bank, you can walk along either bank depending upon places you might like to stop along the way. For example, the Musée d'Orsay is located on the left bank, and the Louvre and the Tuileries are located on the right bank. Whichever route you take, you will see much of Paris along the way, and no map is needed if you just follow the Seine. You can also head straight through the sixth arrondissement towards the Eiffel Tower if you prefer to get a taste of Parisian streets and neighborhoods along your walk. Stop at a café for a coffee or a croissant, and hit a few shops or vendors along the way. Walking through the center of Paris will put you into contact with more of the locals than walking the Seine, especially if you choose smaller streets instead of main boulevards. Even a very simple map should prevent you from getting lost on this tour. For rainy days or simply getting there in a hurry, you can take the subway very easily to the Eiffel Tower. On metro lines six or nine, get off the train at the stop Trocadéro; from line eight, leave the subway at the stop École Militaire.Bus lines 42, 69, 72, 82, and 87 all stop within close proximity to the tower, and you will know you are approaching the area based on what you see outside. A romantic option is to take one of the riverboats on the Seine, which stop right in front of the tower at the Quai Branly. If you are planning a visit to Paris and the Eiffel Tower, you can find abundant information on reaching the tower, as well as buy your tickets online at the official website of the Eiffel Tower. You shouldn't have trouble finding it once you arrive in Paris. From virtually any part of the city, most people can accurately answer the question: "where is the Eiffel Tower located?" if you stop someone to ask for directions to this much-loved and often-visited Parisian monument.